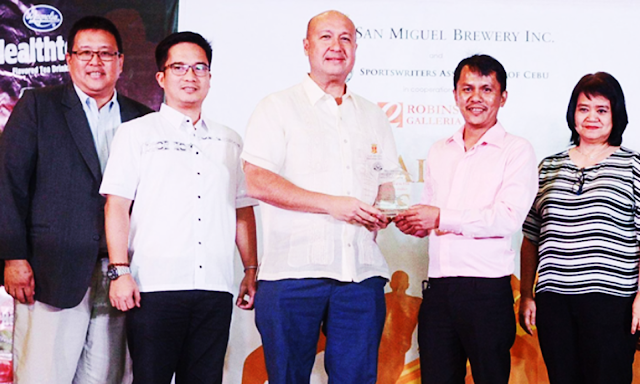 Long time Philippine sports patron Jean Henri Lhuillier received the prestigious Sportsman of the Year honors at the 36th Sports Writers Association of Cebu (SAC) Awards last year in recognition of his efforts in sports grassroots development and support to national teams in tennis and softball in the country. Lhuillier, who is currently the president of both the Unified Tennis Philippines (UTP) and the Amateur Softball Association of the Philippines (ASAPHIL) was awarded by Cebu-based sports writers in the light of his remarkable initiative in bringing Philippine tennis and softball glory to an achievable end. “It was a recognition that I do not take lightly; it encourages me to continuously do my part in bringing glory to Philippine sports. “I’m just getting started. I have high hopes for Philippine softball and tennis, as these are the 2 sports I firmly believe that we have what it takes to be the world’s best, and I vow to give it my best to make these dreams a reality,” Lhuillier said. Currently, Lhuillier, through his Cebuna Lhuillier Age-Group Tennis Tournaments and the UTP, plans to execute a total of 104 tennis events over the whole year as a platform to support the up and rising tennis stars in the country, who will eventually be sent for international competitions. Furthermore, Lhuillier also sponsors some of the country's best tennis players including former world number 18 Treat Huey as well as Rubén Gonzales, who just reached the semifinals of the ATP Dallas Challenger last week. On the other hand, Lhuillier's RP Blu Girls became one of the themes of sports success in the country last season after a successful start to its 2020 Olympics quest on top of beating the world's top 10 softball teams such as Australia, Canada, China Chinese-Taipei, and Mexico along the way. The RP Blu Girls continues to try to earn a spot at the quadrennial Olympic event in Tokyo with its line up of tournaments at the USA World Cup, Canada Cup, Asia-Oceania Qualifying Tournament, and the Southeast Asian Games this year. Meanwhile, Lhuillier also believes in the RP Blu Boys' championship caliber he has lined the team up in the World Men’s Championship in June and the Southeast Asian Games for the men’s softball team. Follow the writer on Twitter: @KristoffBellen.